As a photographer, I’ve got used to hearing that “the best camera is the one you have with you” and up to a point, I agree. For most things, capturing the moment is what’s important, and the quality or fidelity of the resulting shot is secondary. Similarly, as a UX professional, I can sketch with whatever stylus and surface happens to be available at the time because communicating the idea is often more important than the aesthetic quality or fidelity of the resulting sketch. Lately though, I’ve been thinking a bit about how I can improve my sketching ability and make life a bit easier for myself while improving my sketch-based communication. Now, it’s no secret to anyone who’s ever worked with me (even for a very short time) that I have something of a stationery fetish, so it’s not like I ever need an excuse to buy more/different/better supplies, but I’ve been experimenting with different pens, to see which ones work best, and in which situation. For a while, I’ve been using a set of Stabilo 88 Pens that I got from Sainsbury’s and they’re fine up to a point, partly because of their fine point. They’re great for taking notes, sketching in Moleskines and for adding fine detail to larger sketches, but they’re not so good when you’ve got a whopping great expanse of Goldline Marker pad and you’re trying to quickly get an idea across. If getting engaged was the most exciting bit of my trip to San Francisco last summer, browsing the stationery section of WalMart is definitely up there in the top five. 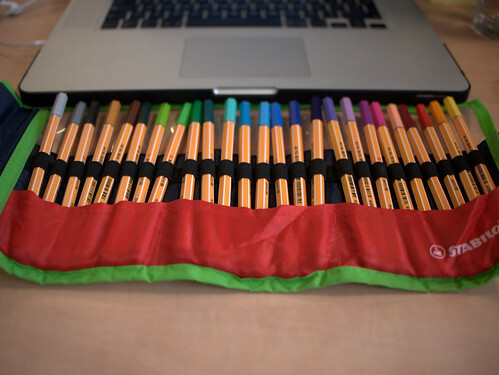 I was persuaded that 24 colours of Sharpie were more than enough and returned to the UK with more colours than are available on this side of the pond, and I’m really glad that I did, because they’ve got me through a couple of fairly sketch intensive projects. The downside to this is that I’ve discovered that I like to sketch in grey/pastels rather than black/brights and I’ve completely knackered the two grey pens and now can’t get hold of replacements. The Sharpies also start off nicely sharp and then get blunt, meaning if you’re doing a set of sketch based paper prototypes, the last sketches are often less detailed and neat than the first ones. So, they’re not perfect either. 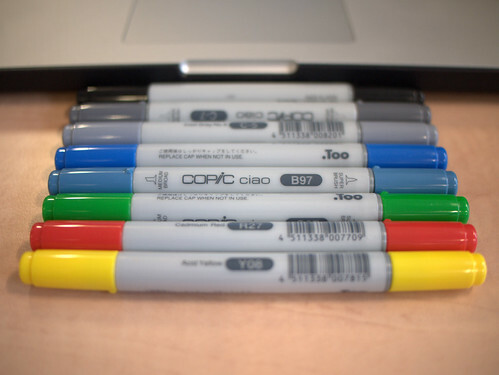 Most recently, I was in a craft shop and wandered across Copic Ciao Markers, which are double pointed and bought a few, in the colours I thought would be most appropriate for the work I’ve been doing recently: black, two greys, two blues, a green, a red and a yellow. 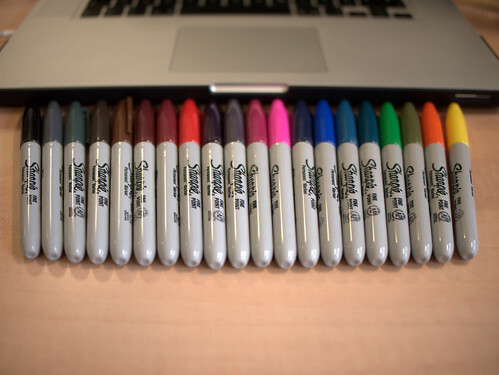 Unfortunately, I didn’t realise the tip I thought was Sharpie-like was actually more of a brush. It’s not a huge deal-breaker, but it’s just not quite what I was hoping for. They’re still nice pens though. After a bit of a conversation with m’colleague Fred I was reminded of Letraset Tria markets, which have three nibs. I’d seen them before but always written them off as too expensive, but that was before I found Cowling & Wilcox and their better than half price sale. Needless to say, I fell in love at first sight. After a bit of dithering, I bought the Product Design set, because I felt like it would give me the best range of colours for sketching in greyscale as well as a decent range of colours for adding meaning, where appropriate. I haven’t had much of a change to use these in anger yet, but I’m hoping with the double whammy of being able to a) refill them and b) get new nibs for them, they’ll last me for years and be worth the investment. Of course, tools are a very personal thing, and while I think this might be the thing that works for me, I’m always interested in how other people work. 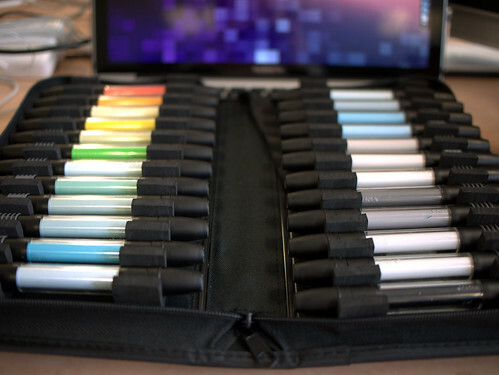 What’s your “Go To” sketching kit?